So....as my husband and I sit in a popular Italian chain restaurant, eating soup and bread sticks like tomorrow may never come, he says to me, "OMG, you need to make this soup into a casserole or a real "dish". And that my friends is how this happy accident began. .....Fast forward 2 days, he keeps asking me to make this. Admittedly I have 2 packages of gnocchi in the cupboard. I have everything else I need to create his own personal heaven. I decide that today is THE day. I turned on my fave music, put on some lipstick and off I went. End result? Complete FAIL! However, that is now how this story ends. 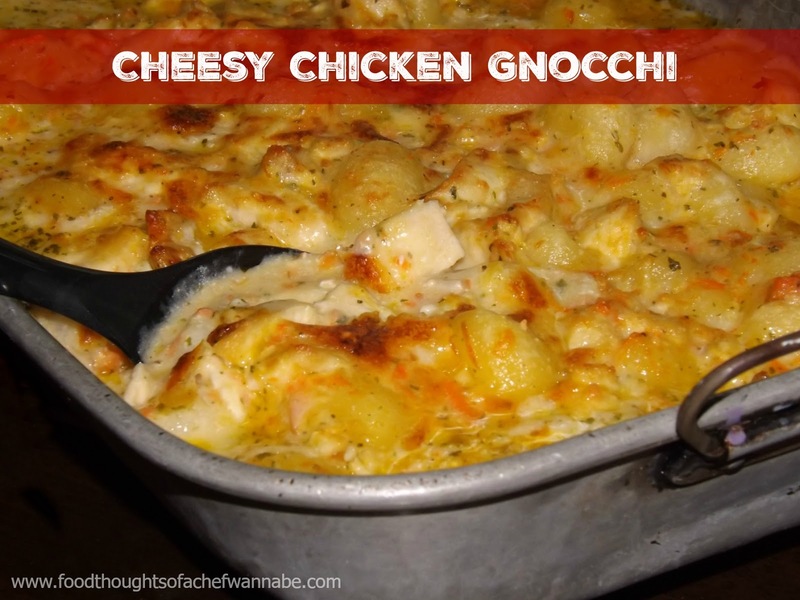 While it was a complete fail as far as a copycat, sort of, not really version of the soup, it turned out to be a pan of cheesy, chickeny, gnocchi-ee goodness and I do not for one second feel bad that it "didn't turn out". I feel so "unbad" I am sharing it with you! This will feed a crowd, and I can't imagine anyone not liking it. If you groove on making your own gnocchi, get on with your bad self, I purchased mine. If you make it, make sure to tag me on Instagram or Twitter!! Snapchat me!! In a large pot, melt your butter. and add your chicken and carrots. Cook over medium-high heat until chicken is cooked all the way through. Add in flour and stir well, let it cook for about 1 minute. Add in chicken stock, while still on medium high heat, bring to a boil, stirring constantly, when it has begun to thicken add in heavy cream, parsley, and all of your grated cheeses. Stir to combine,remove from heat and let sit. Bring another large pot of water to boil. Follow the direction on your package of gnocchi. If you are making them homemade, you are a better person than me, so you will know how to cook them! When the water boils, chuck them in and the second they float they are done. Make sure to get these out right away. 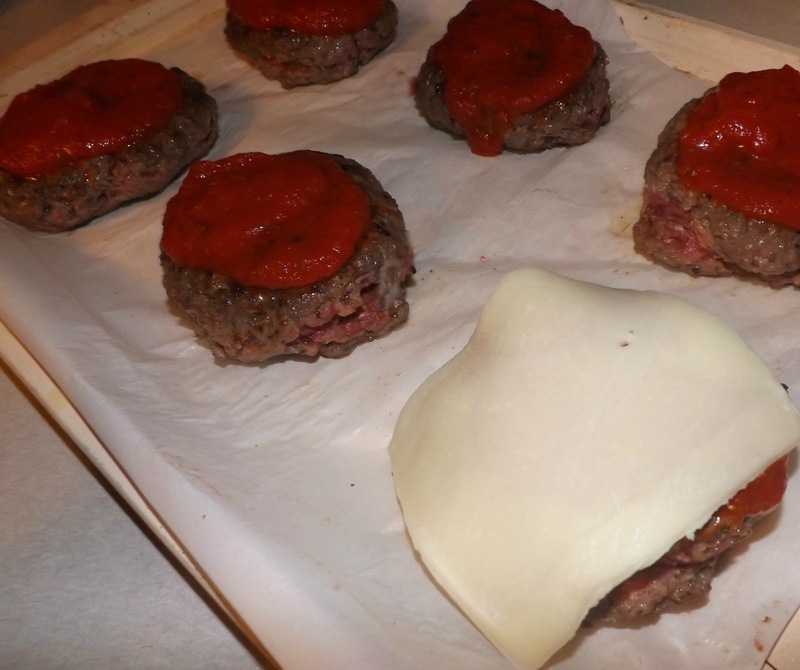 They will be going in the oven for a very short time and you don't need them overcooking. So as I was saying, when they are done, use a slotted spoon or spider and scoop them out, let them drain and toss them in the pot with the sauce! 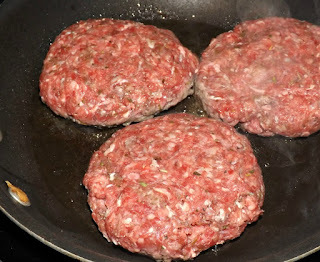 Get them all in, gently stir to combine and pour into a greased 9x13 casserole dish or pan. Bake at 400 degrees for 10 minutes, then turn to broil and let it get golden brown on top! 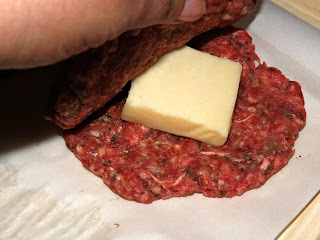 That cheese and butter get a little crusty and it is heaven!! Baby Shower Fun, Food and Games! Hello friends! This is one of those posts that isn't necessarily all about the food, but we will chat about that. I like to share little tidbits, things that pertain to many of us at some point or another. 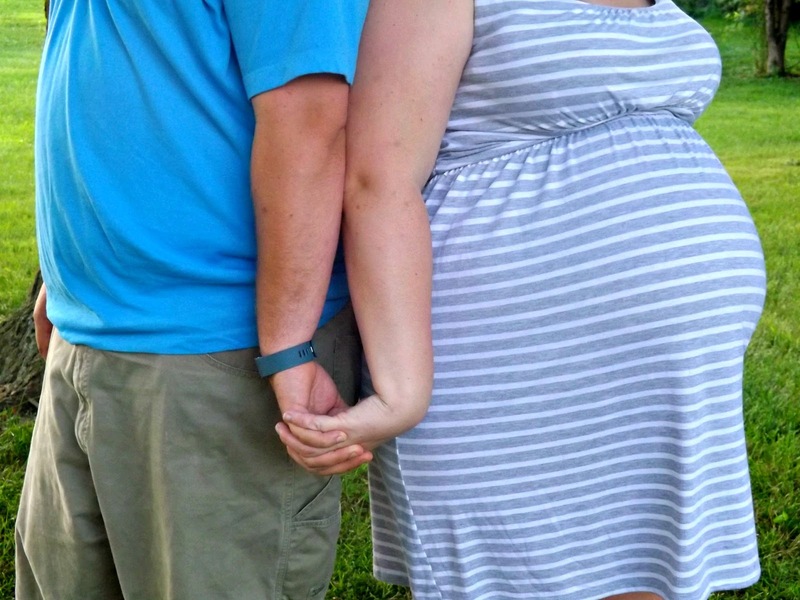 How many of you have thrown a baby shower, no matter how big or small? Many times we have them catered, or at a location other than home but since this was her second baby shower, I decided to have it at home. Intimate, family and friends, and just some informal fun. I want to share what I did, to maybe help you with some ideas if you want to throw your own for someone you love! Here we go! Some back history. Kayla is my daughter in law. She and my son moved to the city we live in 2 years ago. She had a large shower given by her mother when she gave birth to the twins 2.5 years ago but, thinking she was done after them, she got rid of everything when they outgrew it or no longer used it. SURPRISE!! "I am pregnant"! New city, new friends, family, and nothing left for baby. So I decided to throw a small but lovely shower. Here nursery is gray, yellow and I added a hint of blue for the decor. Chevron, and anchors decorated the table. I used a plain old plastic tablecloth for the bottom, notice how I cut the edges so it looked scalloped? Simple and easy things to just take inexpensive things up a notch. 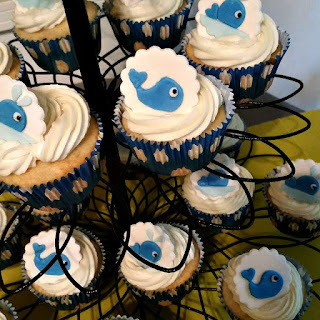 I found a perfect piece of fabric in gray with anchors for the center, and added the whales to the cupcakes. I alternated yellow and white chevron plates with light blue plates. The sweet banner above was made by my sister. I wanted to really personalize it and decided instead of serving a luncheon, or just traditional cake and nuts, etc....I would create a "Craving Station". I would serve all of the foods Kayla has been craving during her pregnancy. We have a close relationship so I was able to do all of this without asking her. OK, let me back up.... Back east where we are from, showers are a surprise. 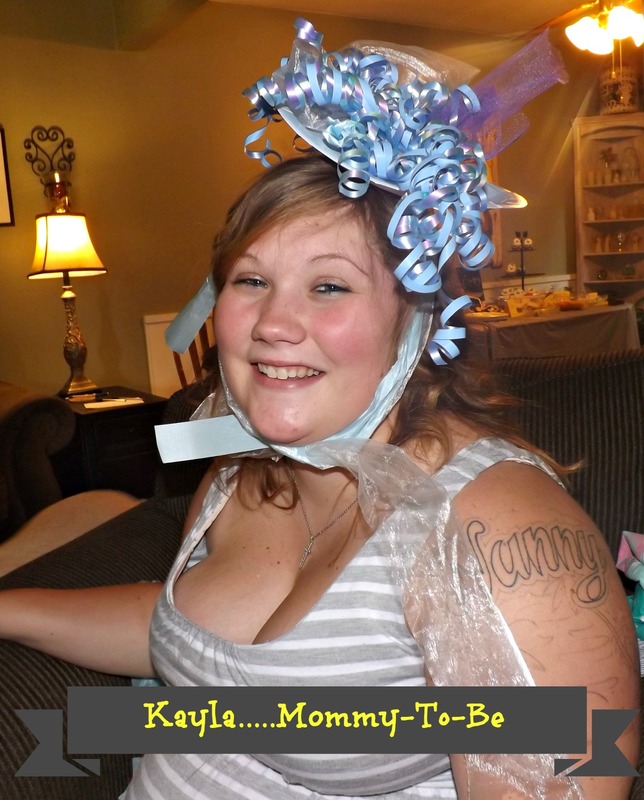 The bride, mommy to be, isn't supposed to know when it is happening. I tried hard to keep it from her, but I am pretty sure she knew and just didn't tell me. I did want to add some cupcakes to the mix, and some dipped Oreo's because, well I needed some sweet stuff! I could have easily just ordered that stuff up and tossed it on a platter and called it good, but, I wanted to fancy it all up if I could and was working on a bit of a budget. Sauerkraut and hot dogs, I baked in a casserole dish. I cut the hot dogs in half, along with the buns, and made them more appetizer sized. Peanut Butter and Jelly, I turned into roll ups. I cut the crust off of plain white bread. Rolled the bread out and spread peanut butter and jelly on it, and rolled it up. Something a little fancier than plain old sandwiches, I thought! Jordan Almonds, just served in a bowl! Cupcakes, I made and used my butter cream cheese frosting. I met a lady at a vendor show recently who owns a baking company. With the theme being anchors and whales, she made me some whale toppers for my cupcakes. Are they not precious?!! You can find her here, if you are in the Omaha area, make sure to like her FB page, Sugar Spiced and Everything Iced and tell her you found her at Chefwannabe! Now for games that we played. Well, I don't know if I would call them games. OK, maybe one was, but one was just for her. I had wanted to give her a nice set of jammies for the hospital and after. 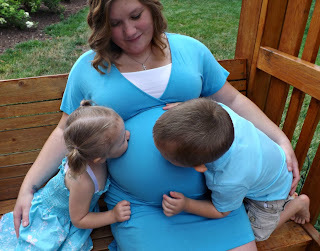 So I decided to ask my son, her husband some questions about her pregnancy. The day of the shower, I asked her to guess his answers, so she was going to get the prize, which was her pajamas. So if that is a game, OK, that was the game one. The second game was actually a twofer. I filled a gray storage cube with random baby things. Outfits, bath necessities, socks, baby wipes, bottle brush, orajel, diaper rash cream, etc. I had Kayla carry the basket around the room, and asked everyone to notice what was in the basket and what Kayla had on. After she went around the room once, I had her go into a different room, and her guests had to write down everything they remembered. All of those items became my gift to her. I had also decorated with some packages of diapers with big bows on them as a centerpiece on the coffee table and those were also part of my gift to her. See how you this budgeting thing comes in? Here is a not so great, but still a photo of the table. I had a chalk board that simply said, "CRAVING STATION" on it. Everyone seemed happy with the food, I personally thought it was genius. Pizza, pickles, peanut butter and jelly, etc.........very fun and unexpected! For drinks I simply served a blue raspberry lemonade and some cucumber water. 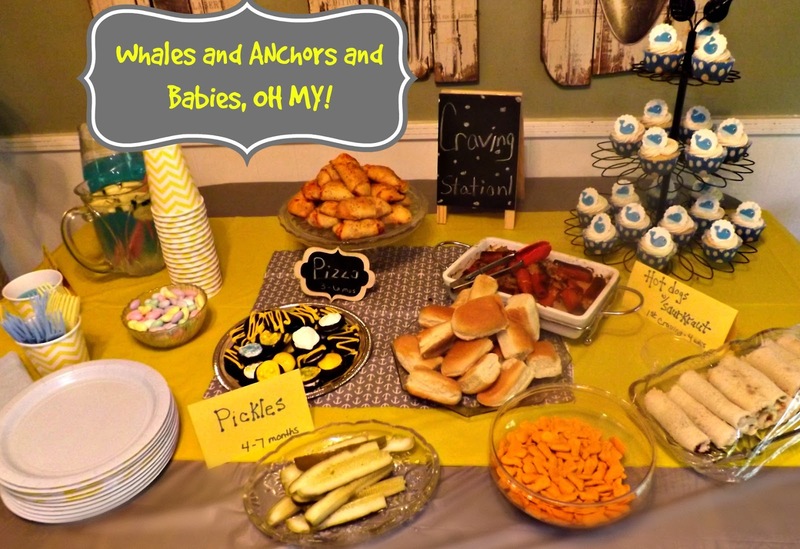 I hope you enjoyed how I threw my baby shower on a budget! Anyone can do it. OH WAIT, I forgot the whale shaped cheese crackers that I found, so I simply had to toss them in the mix as well!! I can't wait to be a Nonna again, number 4 for me! I am so thankful Kayla got to celebrate this birth with her new friends here in Nebraska and her aunts and cousins who love her so much. OK, now that, that is all clear, lets get to the reason I made these to begin with. Shall we? My poor, POOR daughter in law is so pregnant, that I think even her pregnancy is pregnant. She, due to other health issues will not be allowed to get past 37 weeks and she is so there. She is so ready that she will try about anything for a natural induction. ALMOST!! She has tried it all, accept castor oil, she will NOT go that far. The things she reads and I find on the internet are hysterical. I have read anything from eating eggplant Parmesan to bumpy car rides, castor oil smoothies, and everything in between. 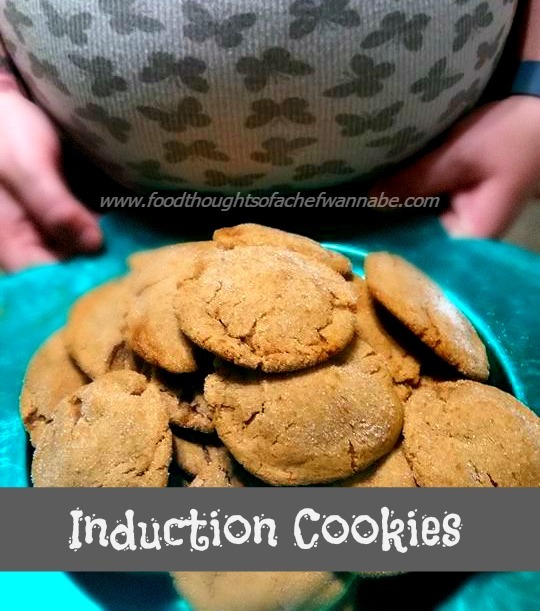 These cookies were just the icing on the cake and I HAD to amuse her and make them today! I don't recall where I got the recipes since I hand wrote it down but, if I find it again, I will post it. There was just no way I couldn't give them a shot. This poor girl can't tie her shoes, can't dress herself, and can barely drive! Without further explanation let me give this recipe to you. She said they are good, but as you swallow them it has a kick from the red pepper! I might have added a WEE bit more red pepper. Don't judge, I want to meet my grandson too! Preheat oven to 350 degrees F,. Combine flour, baking soda, cinnamon, ginger, cloves, salt and cayenne pepper in a medium bowl or the bowl of your standing mixer. Mix until combines. Add in softened butter, sugars, and egg whites. Mix until combined. The dough may seem a bit crumbly but no worries it will all work out. Place your extra granulated sugar in a bowl. Roll dough into balls, about 3/4 inch balls and then roll in sugar and place on a parchment lined cookie sheet. 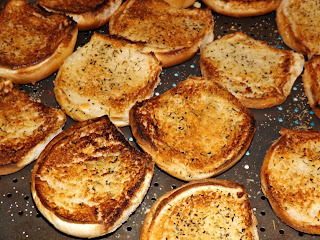 Do this with all of your dough, molasses, and then bake for 8-10 minutes or until golden brown! Enjoy the this fun wives tale and don't forget to BREEEEEATH! Good evening friends! Can you believe it is AUGUST? Where did the summer go? WHOOSH, gone. I wanted to get you another no churn ice cream creation because sadly, and unfortunately for the world, some people think ice cream is only for summer. (Insert dramatic gasp here) It is true. 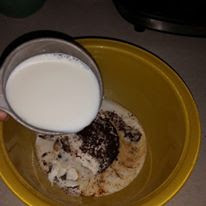 Tiramisu is my favorite dessert. HOWEVER, there is one thing that makes me nuts. I hate the dark cocoa on top. A lot. In my world, it should be topped with crushed amaretti cookies. Are you pickin' up what I am throwin' down friends? Uh huh, my fantasy and reality collided, and made ice cream. That was so cheesy.....teetering on sounding like an 80's love song. You will notice some odd ingredients. Trust me on this one. I wanted to still have different textures, and all the "mouth feelings" of tiramisu. Now, if you want to omit the amaretti cookies, and crush a different kind of cookie on top, don't let me stop you. But don't skimp on the espresso sprinkled on top and please love this as much as I do!! Add all ingredients to a small bowl and whisk until completely combined, set aside. In the bowl of your stand mixer OR just a bowl and a hand mixer, whip the heavy cream to stiff peaks. Add in vanilla extract and whisk a couple of more seconds. 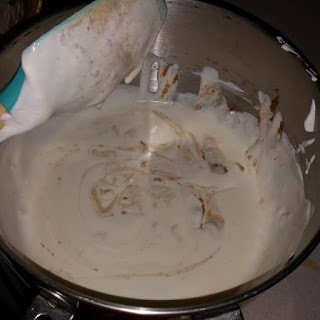 Now, fold in the sweetened condensed milk. When the mixture is completely combined, add spoonfuls of the pudding mixture on top. 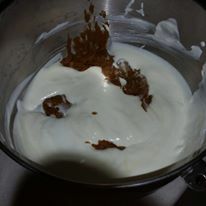 Carefully use your spatula to swirl the pudding mixture through the whipped cream mixture. 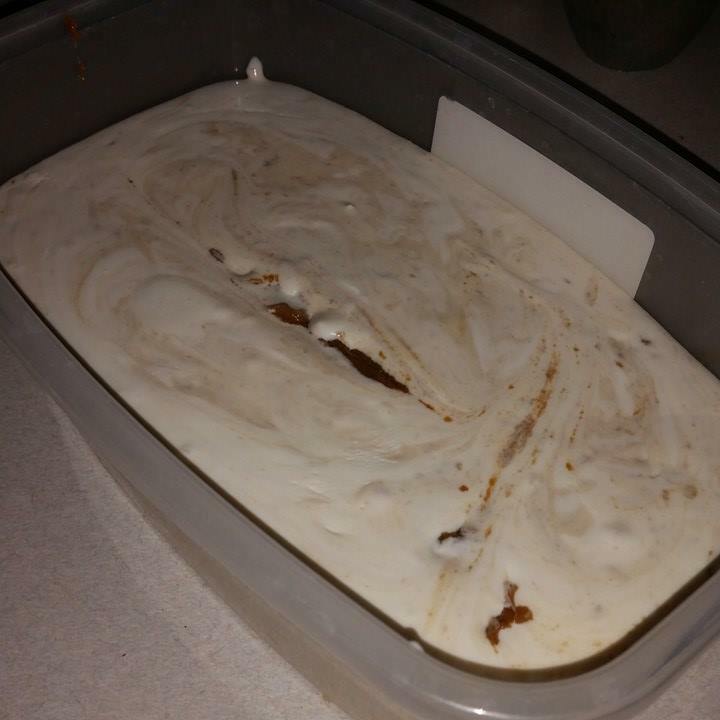 You don't want it to mix all the way in, just swirl it. Slowly pour mixture into a container suitable for freezing. Take your cookie crumbs and cover the top. 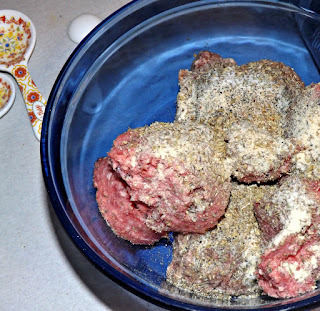 Sprinkle a little espresso powder on top and freeze for at least 5 hours. 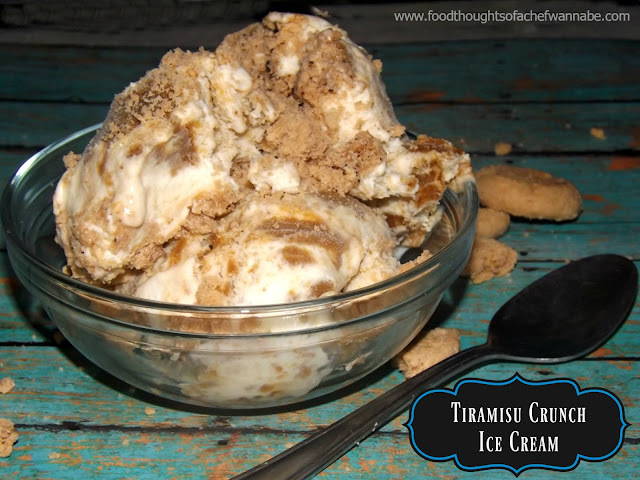 Enjoy my version of the perfect tiramisu, in ice cream form! Make sure to tag me on Instagram, Twitter or post a photo on Facebook! 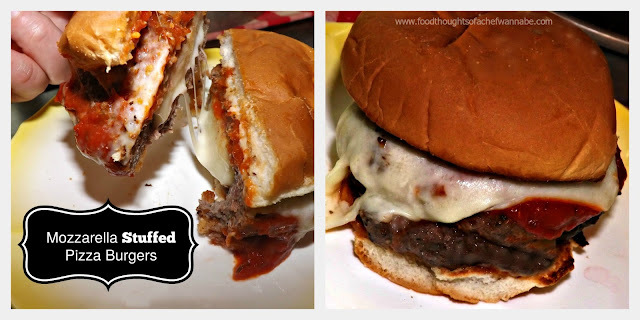 I love seeing how you recreate my food!